The Microsoft dividend will rise again in September if the company follows a well-established pattern. For the past nine years, Microsoft Corp. (Nasdaq: MSFT) has announced a dividend hike in September to be applied to the next quarter's payout. The annual increases have grown the quarterly MSFT dividend from $0.08 a share to the current $0.31. The current yield is 2.65%. The next regularly scheduled payout is Sept. 10. The Redmond, Wash.-based company has increased its dividend payout every year in that span except for 2009, when the Microsoft dividend remained at $0.13. Stocks that pay a dividend – and raise it regularly, as Microsoft has – are favorites of income investors. And for good reason. A Morgan Stanley (NYSE: MS) study in 2013 found that 42% of the gains in the Standard & Poor's 500 Index since 1930 had come from dividends. But given that a Microsoft dividend hike is a near-certainty, the current question for investors in Microsoft stock is how big the hike will be. Over the past decade, the Microsoft dividend increases have ranged from a low of 10% in 2007 to a high of 25% in 2011 (if you ignore 2009). The minimum hike would be $0.03 a share, which would bring the Microsoft dividend to $0.34, a 9.68% increase. But it's more likely Microsoft will resist dipping below the 10% threshold and opt for a $0.04 hike, representing an increase of 12.9%. Microsoft could also opt to raise its dividend by $0.05, a 16.1% increase. 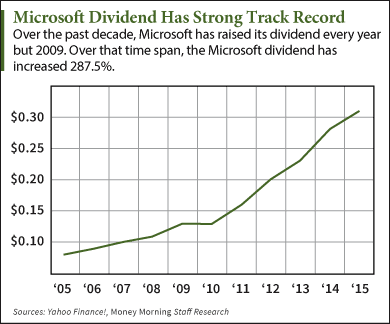 The last time the Microsoft dividend increased by $0.05 was in 2013, so it's not unprecedented. But given some headwinds the company is experiencing this year, look for MSFT to stick with the $0.04 increase. Whether Microsoft can maintain these dividend increases depends on how well it can grow out of its historic dependence on its flagship Windows and Office products. The numbers: Wall Street is looking for Microsoft earnings per share at $0.56. That estimate is down from $0.62 three months ago, and it would be roughly flat from last year's $0.55. The revenue forecast is $22.05 billion, which would be a 5.7% decrease from the same quarter a year ago. The last quarter: Microsoft posted earnings of $0.61 in its fiscal Q3, easily beating estimates for $0.51. Still, it was a drop of more than 10% from the same quarter a year earlier. The company also beat on revenue, with sales of $21.73 billion eclipsing the $21.06 billion Wall Street estimate and rising 6% year over year. The stock: MSFT stock is flat on the year, but plunged 13% in January before recovering just as rapidly in April – both moves precipitated by earnings reports. Over the past two years, however, Microsoft stock is up 46%. A second consecutive beat could push MSFT higher. MSFT is trading at $46.85 today (Monday) and has a one-year price target of $50.13.